"...the magazine equivalent of throwing an M-80 into a bowl of ramen and taking a crime-scene photo of the results." That's how--writing in the second issue--editor Peter Meehan described the first issue of Lucky Peach, the irreverent food quarterly launched in 2011 by Meehan and Momofuku chef David Chang. Each issue revolves around a theme, such as the apocalypse (#6), gender (#8), and obsessions (#14). The magazine's recipes range from the exotic to the simple, including cultural mash-ups like a recipe from issue #1 for Instant Ramen Cacio e Pepe. They once created an issue-within-an-issue (for #9) called "Mad/Guts" about a René Redzepi food conference and stuffed the small-size book inside an insert with a photo of a woman's belly--so extracting the book was like conducting a c-section. And they haven't shied away from complicated recipes, like the holiday issue's (#13) 11-page spread on constructing an elaborate Tuscan-style Christmas gingerbread house, complete with blueprints. Or the Roast Chicken, 2034, a.k.a. "The Frankenbird" (#6), a chicken that had its skin carefully removed, its meat replaced with pork glued in place with meat glue, the skin carefully reattached, and the whole thing roasted. So when Peter Meehan and the editors of Lucky Peach put out the cookbook Lucky Peach 101 Easy Asian Recipes, I wondered how "easy" the recipes would really be. After all, a chef like Chang probably has a different idea of what's "easy" than a home cook like me. Thankfully, the recipes in the book really are pretty easy with one important caveat: the ingredients. 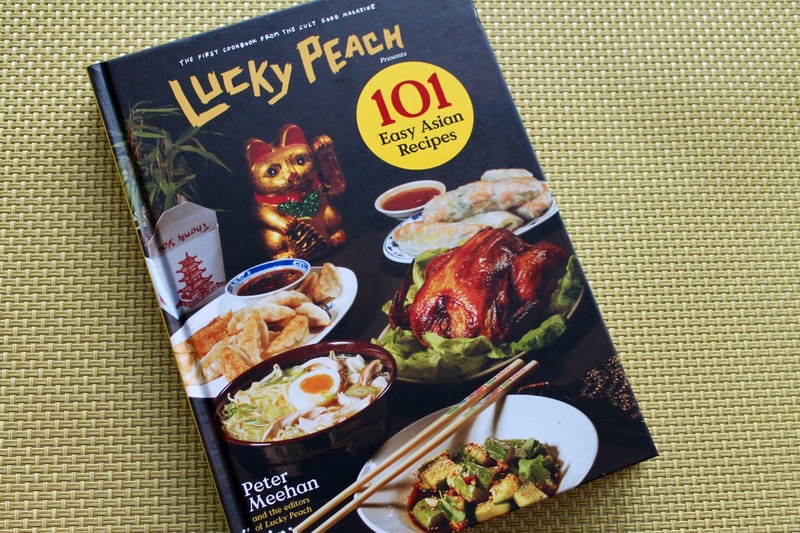 This isn't the kind of Asian cookbook that instructs you to make Pad Thai with ketchup; recipes call for authentic ingredients, the kind you can maybe find in the Asian foods aisle, although more likely you'll need to visit an Asian market. Recognizing this, the cookbook opens with a helpful section explaining the ingredients called for in the recipes. Substitutions are sometimes provided in this section. Take Shaoxing wine, for example. The book acknowledges that many cooks substitute sherry for this ingredient, which is similar in some respects. But they also note that shelling out for the authentic stuff will make the dish taste better, however, they also acknowledge that the cheap Shaoxing wine you can find in the Asian aisle, which has salt added to make it non-potable, will also work fine. The book's recipes are divided into 12 categories, with a dozen or so recipes for most categories save for dessert, which features only two--well, really only one, since the first recipe is sliced oranges. The other is Egg Custard Tarts, a very simple recipe that uses puff-pastry cut-outs baked in a muffin tin to form molds for a simple vanilla-egg custard. It doesn't strike me as particularly Asian, but it does sound good and quite simple if you use store-bought frozen puff pastry. The book acknowledges that the default Asian dessert is cut fruit (hence the oranges recipe). 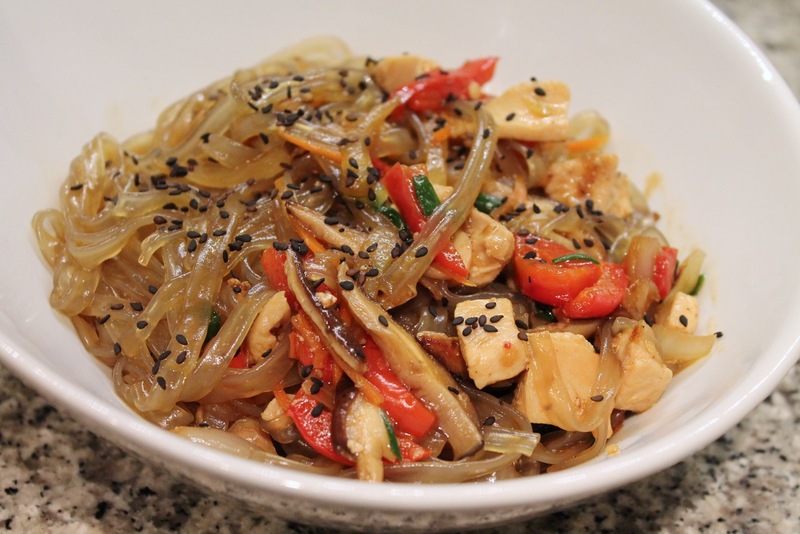 Elsewhere, the recipes are clearly Asian and run the pan-Asian gamut of Chinese, Japanese, Korean and other cuisines. Many of these you'll probably recognize, like Beef Satay, grilled skewers of flank steak marinated in a mixture of coconut milk, garlic, ginger and spices and served with a simple peanut sauce made with creamy peanut butter, soy sauce, garlic and water. I made a sampling of the recipes from the book and was pleased with all of them. I started with Jap Chae, one of my favorite dishes to order in Korean restaurants. It's a noodle and vegetable dish made with sweet potato noodles, which are a translucent gray color when dry and even first cooked but, but once tossed with a a brown sauce, they pick up that color, turning a beautiful golden brown. The book notes that the dish is often a side, although I added chicken to mine and served it as a main. The hardest thing about this recipe was finding the noodles, which weren't to be found in the Asian aisles at Giant or Whole Foods but which I did acquire from an Asian market in Chinatown. This recipe was easy to follow and the resulting dish was tasty and exactly what I expected. Next, I went for a soup-and-salad combo of the "Chineasy" Cucumber Salad and the Hot and Sour Soup. 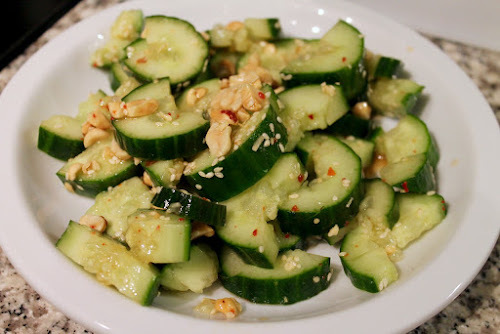 The salad is super easy--it's just cut up cucumbers with peanuts, cilantro and dressing, but again assembling the dressing could prove the most difficult task, as it calls for Chinkiang vinegar (also known as "black" vinegar) and Sichuan chili oil. Lacking the latter ingredient, I sprinkled my salad with a pinch of gochugaru, which is Korean chili pepper flakes. This gives the salad just a bit of kick. It's a wonderfully simple and refreshing side to something spicier. For the soup, I was so excited the book had a recipe for Hot & Sour Soup, the Chinese staple that is one of my favorite soups and among the first Chinese dishes I learned to love as a child. I remember, as a teenager, making a version of Hot & Sour Soup from a packet that was absolutely terrible (I actually made it multiple times, despite the fact that it didn't taste anything like the soup from a Chinese restaurant). Thankfully, the Lucky Peach version is really good, a faithful rendition of the soup that's hot (although not too much) and flavorful. A couple weeks after making this, I ordered hot and sour soup from a Chinese restaurant. It was hot--far hotter than this--but had an unpleasantly thick texture, likely thickened with cornstarch. The Lucky Peach recipe doesn't thicken the broth, and it doesn't need it. In making this, I made a substitution regarding the pork. The recipe calls for 8 oz. of pork shoulder cut into matchsticks. For simplicity, I substituted ground pork. I also ended up substituting an additional 8 oz. of ground pork for the tofu, since Giant was out of tofu the day I made this. Flavorful-wise, the soup was still tasty, although I definitely would recommend making the soup with a mixture of pork and tofu, as I like the combination of textures. Lastly, there's a mistake in this recipe: dried wood ear mushrooms are soaked in step 1, but then never reappear. They should be added after returning the soup to a simmer in step 3 (this was corrected in the online version). Here again, I made a substitution, as I couldn't find dried wood ear mushrooms, so I used fresh shiitakes. Still delicious. Other soups in the book include miso (located in the short "breakfast" section), chicken noodle (similar to the chicken soup that ran in Lucky Peach issue #1), beef noodle soup (a recipe that looks like a simpler version of the delicious soup at Momofuku CCDC), a miso version of clam chowder, a slow-cooker version of pho and, of course, ramen. The last thing I made from the book was Kung Pao Chicken, an adaptation of the Kung Pao Shrimp that appears in the book (substituting cubed raw chicken for shrimp is an easy swap). 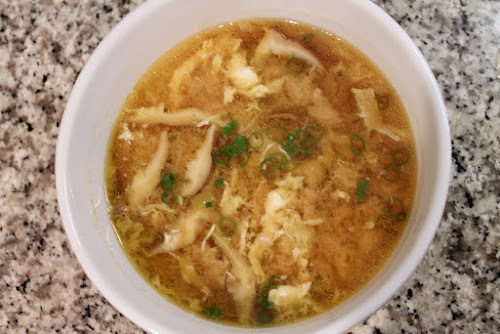 Like Hot and Sour Soup, this is another of my long-time favorite Chinese recipes, one that I have a good go-to recipe for. When I make it, I use red chili pepper flakes, whereas this recipe calls for 10 small dried red chilies. The challenge with this instruction is which chili pepper to use. I used chiles de árbol, which I found at Whole Foods. They gave the dish a mild spiciness (unless you eat one--then wow, be careful, as they are hot). The recipe states that they intentionally dialed back the heat, but it would be easy to ramp back up. If you like the look of a few whole chilies, you could always use both the 10 (or more) dried chilies plus a generous pinch of chili flakes. I liked the heavy use of vegetables in this recipe, which includes red and green bell peppers and celery, in addition to the usual scallions. There are lots of other dishes I want to try. Thumbing through the book while writing this article, the Miso-Glazed Explant caught my eye. Again, this is super-simple: cut Japanese eggplant in half, brush with oil, roast and glaze with red miso and mirin. 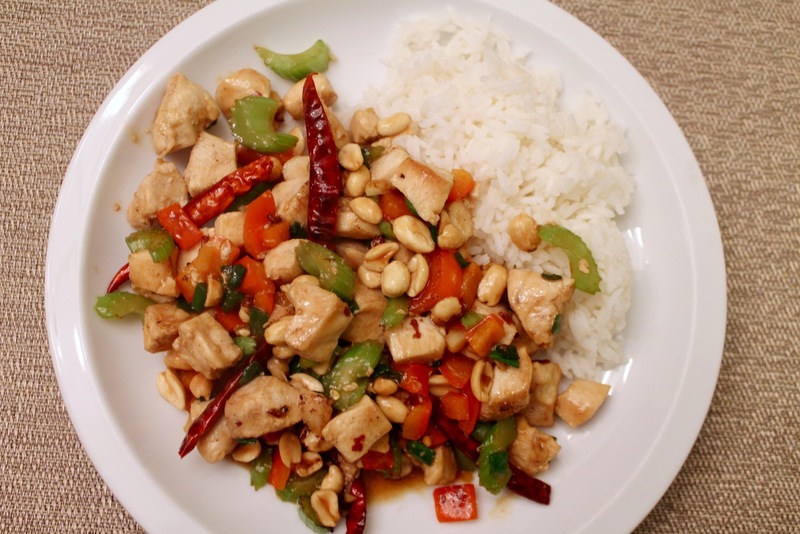 Sounds delicious, Asian and easy, just as promised. Note: The original recipe does not include chicken, which I added. Other substitutions I made are noted below. 1. Cook the noodles in boiling water according to package directions. While they cook, prepare a large bowl of ice water. When the noodles are done, drain them, then transfer to the ice water to cool. Once cooled, set aside in a large bowl until ready to use. 2. Heat oil in a large skillet over medium heat. Add the chicken and sauté until cooked through, about 8 minutes, stirring occasionally. Remove chicken from pan. Add additional oil to the pan if needed. When the oil is hot, add the onion and bell peppers and sauté until the vegetables have softened, about 5-6 minutes. Season to taste with salt and pepper, then add the carrot, mushrooms, scallions and garlic and cook, stirring occasionally, until the vegetables are lightly browned, about 10 minutes. 3. Add the mirin to the pan, and stir to combine and deglaze the pan, scraping off any browned bits on the bottom of the pan with a spatula or wooden spoon. 4. Add the cooked chicken and vegetable mixture to the bowl with the noodles. Add the soy sauce, sugar, sesame oil and sesame seeds and toss to combine. 1. If using fresh shiitake mushrooms, heat 1 tbsp. of oil in a large sauté pan over medium heat. Add mushrooms and sauté until lightly browned, about 5 minutes, then remove from the pan and aside. If using dried wood ear mushrooms, place them in a bowl and cover with warm water. Soak until plump and pliable, about 30 minutes. Drain and set aside. 2. Heat remaining oil in the pan over medium heat. Add the garlic, ginger, scallions, and sauté, stirring occasionally, until the meat is cooked through, about 5 minutes. Add the broth and increase heat to medium-high to bring to a simmer, then reduce heat to medium-low and continue simmering. 3. Stir in the tofu (if using), sugar, vinegar, soy sauce, pepper, sesame oil and sriracha. Return the mixture to a simmer. Adjust to taste with additional salt, srirarcha and/or vinegar, and stir in the mushrooms. 4. Slowing add the beaten eggs to the soup while gently stirring, which will set the egg into strands. Serve immediately. I like to add a side of crunchy fried Chinese noodles.